There's always a need for a finer finish on our work, and what better way than to try out some abrasives that help us do just that - Jost abrasives to be precise. In the past, woodworkers tended to use a fairly basic range of abrasive papers for initial preparation and then the finishing stages. However, an increasingly broad range of specialised finishing materials are now available from manufacturers who are often less well known, such as Jost from Frankfurt, Germany, which are now available in the UK via Southern Filters - www.southernfilters.com. I decided to try out their Useit - Abrafilm abrasive discs. Abrafilm is an abrasive particle coating in grits from a very coarse 40-240 Zirconia grit and 240-3,000 ceramic grit with a consistent spread of grades in between. The grit is applied to a film carrier, hence the name, and it is an 'open coat' type. 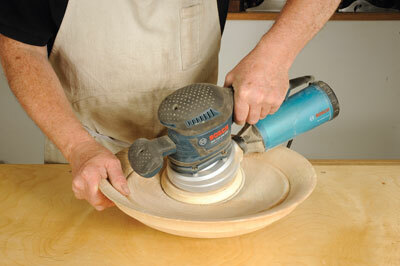 It is suitable for wet or dry sanding and has a stearate coating to ensure it doesn't clog. Their 'Superpad P' material is a porous foam backing which attaches straight on to hook-and-loop sanding pads without the need for an intermediate attachment layer and thus helps to avoid 'scrub damage' to the machine's sanding pad. 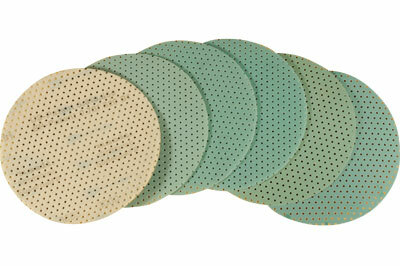 A massive advantage of these pads is that they extract through the entire pad for improved dust removal and are suitable for use on any make of sander of the correct size, which makes them incredibly versatile. Because the pads are soft you can always cut them down to fit a smaller machine if you need to. In addition, this material can also be used for manual finishing and I understand that Southern Filters are expecting to introduce rolls of the Abrafilm as well as the discs currently supplied, so keep checking the website for updates.